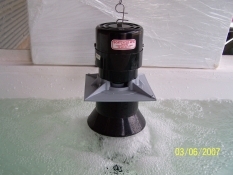 This is a quieter agitator with skirt, which eliminates noise and is designed to concentrate all the agitation right into the vats. 110-volt fully enclosed 1/20hp heavy-duty 1550 rpm 1.5 amps fan cooled continuous duty motor with special factory sealed bearings. Motor is designed especially for agitators. Factory built in 8 ft cord and grommet. It has 5/16" shaft and high impact plastic paddle, 10 1/2" x 4" basket, extra heavy-duty replaceable lower bearing centered by precision machinery for perfect alignment. It has a ring for hanging, large washer underside motor prevents water from entering lower motor bearing and thermo overload protection. One year pro rata guarantee. Wt. 8lbs ea.